ENCINITAS — Nestled between a string of residential dwellings within downtown’s third street, the historic Encinitas boathouses have stood the test of time to became a town treasure. 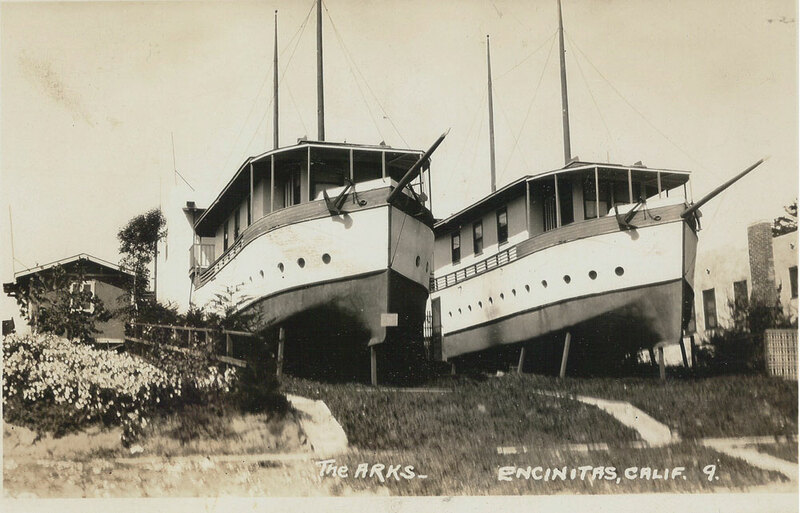 But with a visible need for upgrades and a plan to one day convert the landside vessels into a museum, the Encinitas Preservation Foundation, which owns the structures, is seeking an estimated $250,000 to complete foundation repairs and other renovations. On July 22, Tom Cozens, a member of the foundation, led a walkthrough with county officials, including Mayor Kristin Gaspar, to promote continuing preservation efforts. San Diego County Supervisor Dave Roberts joined the group, and he said he was instantly enthralled by the history surrounding the boathouses. “Many people consider the boathouses to be one of the iconic symbols of Southern California and I really enjoyed seeing them up close and in personal for the first time,” Roberts said. Suggested renovations for the boats include replacing the wood to fight dry rot, improving overall drainage and shoring up foundation issues. While plumbing and electrical wiring have already been upgraded, the foundation is also seeking long-term funding to pay off the remaining mortgage. Cozens said he hopes to complete fundraising within 12 months. “The $250,000 is a ballpark estimate apportioned approximately as $50,000 for landscaping, $150,000 for new foundations for each boat including covering lost rent during construction and $100,000 to complete renovations including plumbing, electrical, roofing/waterproofing, and removal of old paint and repainting,” he added. No timeline has been set to reconfigure the vessels into a museum. Cozen said the process has been complicated due to the recent passage of Proposition A, which requires a public vote to change the zoning for the boats to allow ongoing public access at the museums. Working with the city’s grants administrator, the group will eventually submit a request for an initial amount to the Board of Supervisors who will deem what measures are necessary. Roberts said he hopes the grant process is accomplished by the end of the year, noting that the county Neighborhood Reinvestment Program would likely provide funding. Additional fundraising efforts by the foundation have included the historical-Encinitas bus tour which raised support for the boathouse in June. The foundation acquired the boathouses in 2008 for $1.55 million. Miles Minor Kellogg, a former marine engineer, constructed the dwellings in 1928, implementing wood used from the old Encinitas Hotel and recovered lumber from the Moonlight Beach Dance Pavilion to complete the project. The boathouses, which are still rented out to tenants, stand 15 feet in height and rest atop steel pipe braces which are supported by a massive subterranean concrete slab. Each boat is about 20 feet in length and feature plaster hulls, a deck and a large, flat-roofed pilothouse. Inside each boat includes cabins below deck, a galley, dining room and living room area.